Diese Schicht seltener Mineralien kann nur aus dem All stammen, sind sich die Geologen sicher. Geologen haben in Schottland Spuren eines bisher unbekannten Meteoriteneinschlags vor etwa 60 Millionen Jahren entdeckt. Es handle sich um den ersten beschriebenen Einschlag im Erdzeitalter des Paläogens in dieser Region, teilte die Geological Society of America (GSA) am Donnerstag mit. Wo genau der Himmelskörper auftraf, ist derzeit noch unklar. Die Wissenschaftler hatten an zwei Stellen auf der Isle of Skye vor der Westküste Schottlands ursprünglich Vulkangestein untersucht. Sie entdeckten, dass eine Schicht seltene Mineralien enthielt, die nur aus dem All stammen können, wie Studienautor Simon Drake von der Birkbeck-Universität erklärte. Es sei überraschend, dass dies erst jetzt entdeckt wurde, da Skye von Geologen sehr gut untersucht sei, fügte er hinzu. Ob der Einschlag Einfluss auf die Vulkanaktivität in der geologischen Region des Nordatlantiks hatte, sei noch nicht klar. 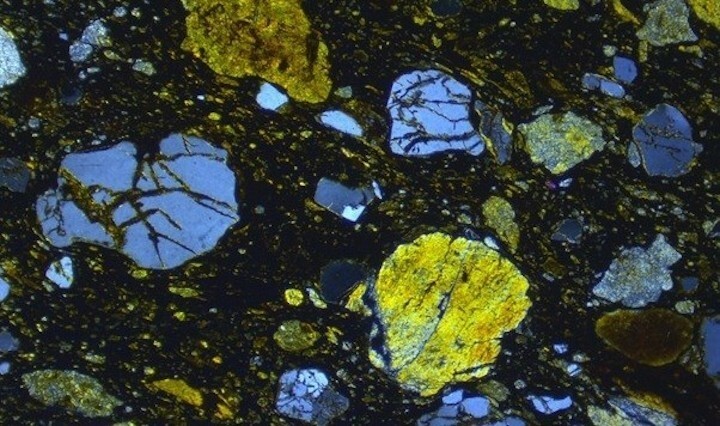 BOULDER, CO, USA: Geologists exploring volcanic rocks on Scotland's Isle of Skye found something out-of-this-world instead: ejecta from a previously unknown, 60 million-year-old meteorite impact. 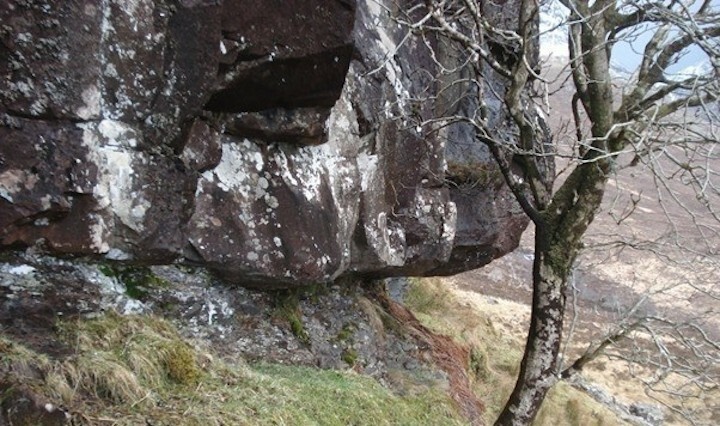 The discovery, the first meteorite impact described within the British Paleogene Igneous Province (BPIP), opens questions about the impact and its possible connection to Paleogene volcanic activity across the North Atlantic. Lead author Simon Drake, an associate lecturer in geology at Birkbeck University of London, zeroed in on a meter-thick layer at the base of a 60-million-year-old lava flow. "We thought it was an ignimbrite (a volcanic flow deposit)," says Drake. But when he and colleagues analyzed the rock using an electron microprobe, they discovered that it contained rare minerals straight from outer space: vanadium-rich and niobium-rich osbornite. These mineral forms have never been reported on Earth. They have, however, been collected by NASA's Stardust Comet Sample Return Mission as space dust in the wake of the Wild 2 comet. What's more, the osbornite is unmelted, suggesting that it was an original piece of the meteorite. The team also identified reidite, an extremely high pressure form of zircon which is only ever associated in nature with impacts, along with native iron and other exotic mineralogy linked to impacts such as barringerite. A second site, seven kilometers away, proved to be a two-meter-thick ejecta layer with the same strange mineralogy. The researchers pin the impact to sometime between 60 million and 61.4 million years ago (Ma), constrained by a 60 Ma radiometric age for the overlying lava flow, and 61.4 Ma for a basalt clast embedded within the ejecta layer. The team published their discovery in Geology this week. The discovery opens many questions. Is the same ejecta layer found elsewhere in the BPIP? Where exactly did the meteorite hit? Could the impact have triggered the outpouring of lava that began at the same time, or be related to volcanism in the larger North Atlantic Igneous Province? 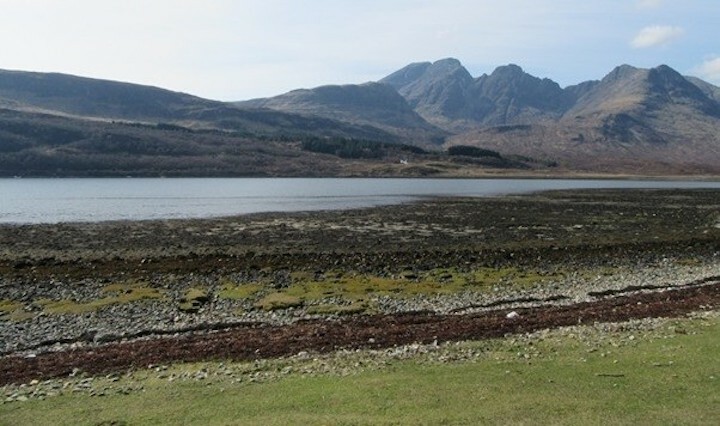 So far, Drake has collected samples from another site on Skye that also yield strange mineralogy, including another mineral strikingly similar to one found in comet dust. Drake says he was surprised that the ejecta layer had not been identified before. After all, the Isle of Skye is famously well-trampled by geologists. The second site had not been sampled in years. As for the first site, Drake suspects the steep, rough, and very boggy terrain probably discouraged previous workers from sampling the layer. "We were sinking in up to our thighs. I distinctly recall saying to (co-author) Andy Beard, 'this had better be worth it.'" Now, says Drake, "It was worth it." Quelle: The Geological Society of America, Inc.